A common leopard (Panthera pardus) was killed by a group of hunters in the outskirts of a little town Dadyal, which is located near the Mangla Dam, confirms Javaid Ayub Director Wildlife and Fisheries Department of Pakistan controlled Kashmir. The animal was shot by the gun and then beaten to death, eye witnesses say. A video of the incident has been uploaded on ‘YouTube’ site by the community members. The video clip shows a group of people thrashing the dead body of the victim with a rod. Now it is dead,’ one of perpetrators states in the video, speaking in local Mirpuri language. Officials are struggling to punish the culprits who have been accused of having support of local influential politicians. So far at least four persons have been accused unprovoked murder of an animal and police and Wildlife officials are pursuing legal action against the people involved in the incident. According to Pakistan’s laws, people responsible of animal cruelty face six month imprisonment and have to pay fine equal to the commercial price of the animal which they have killed. Illegal hunting is common in Pakistan and its administrated region of Kashmir where public lacks awareness about the animal rights and wildlife protection and judicial system is fragile. Jammu and Kashmir, a mountainous state divided between India and Pakistan, has an abundance of forests which are habitats of many species of endangered flora and fauna. In recent years degradation of natural habitat has contributed to endangering regional environmental life. It has also forced wildlife to leave the natural territories and enter human populations in search of food. There are increasing public complaints about the intrusion of wild cats into farmers’ private lands and depredation of domestic livestock. Locals accuse the Common Leopards and other feral animals of attacking and killing their cows, goats, sheep, pets and other livestock. On the other hand, ecological experts describe the increased presence of wild cats near to the human populations as a visible sign of the increased loss of natural prey for the wildlife as a result of environmental damage caused by humans. “(The) Common leopard is a very shy animal and does not attack without solid reasons (danger to its life or living place, cubs etc),” said Khurshid Ahmed, an environmentalist from Peshawar University. The region where people killed the Common Leopard is located in the vicinity of a National Park famous for its richness in ecology and biodiversity. The Peer Lasora National Park is located near the border dividing the disputed state of Jammu and Kashmir. It has several threatened and endangered species of mammals and birds, including the Common Leopard (Panthera Pardus), Cheer Pheasant (Catreus Wallichi), rhesus monkey (Mecaca Mulata) and barking deer (Axis Porcianus). A WWF Pakistan study estimates that at least 70 per cent of the original habitats in this region have been destroyed due to habitat degradation, mining, stone crushing, deforestation, forest fire, prohibited hunting of the natural prey and other threats. The leopards face several threats to their survival and have attained attention of conservationists internationally. The Common Leopard has been included as a “Near Threatened” category in IUCN red data list. Globally, The IUCN Red List of Threatened Species is widely recognized for evaluating the conservation status of plant and animal species. Pakistan is one of the few countries in the world that harbours the cat family of rare animals. In the last few decades Pakistan has speeded up its conservation attempts of the Snow Leopard, but the Common leopard has failed to obtain the required interest of the government and the public. 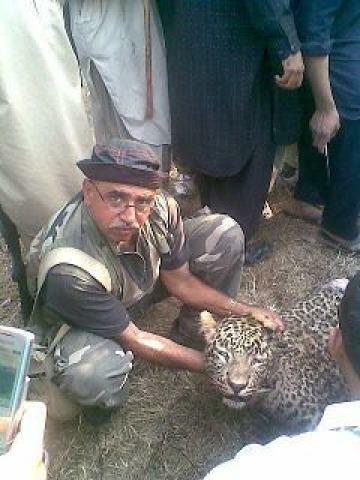 As a result, the Common Leopard has become extremely uncommon in Pakistan. The lack of public awareness about the wildlife and the higher occurrence rate of poverty in rural areas are blamed for this neglect. For the protection of Snow Leopard massive awareness programmes, including livestock insurance schemes have been introduced in some areas of Pakistan, e.g.Ayubia National Park. Communities have responded positively to such Eco-Friendly projects. Environmentalists believe that starting of similar sustainable efforts can raise awareness among the public in other regions, as well as be helpful for the survival of various natural species that are facing the dangers of extinction. “There is a dire need to impart awareness about the Common Leopard for the existence of our food chain as with its extinction, our biodiversity is going to face greater negative imbalance causing faster degradation to natural environment. This directly impacts the lives of the local community in special and the area and region in general”, maintains Mr. Khurshid, who has extensively worked on ecological resources of Northern Pakistan, including Jammu and Kashmir.